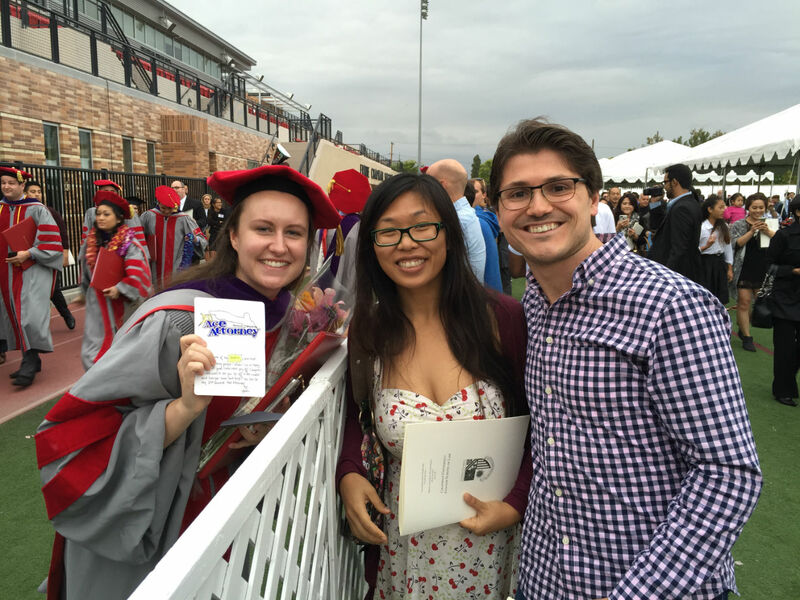 Yesterday was Anela’s graduation from Chapman Law. Congrats, Anela! Aw, look how happy she looks. It’s a beautiful campus, and I liked how diverse the people were. The Honorable M. Margaret McKeown, Judge, United States Court of Appeals for the Ninth Circuit gave the address. She was really fascinating and a great speaker. My favorite part was that she talked about it’s good to give people food. “And when people have food in their mouth, they can’t yell at you.” Great advice. The booklets also contained a list of highest course grades. Each student who was awarded the highest grade in a class that semester got their name listed in the book along with the classes. That’s such a cool idea. If I could have participated in that, I think I would have pushed a lot harder in college. It’s no surprise that Anela was listed! As soon as it clicked that the slightly mispronounced name called was Anela’s, I tried to get a picture while cheering loudly. If you squint hard enough, I swear that’s her. Here’s Anela and gem after the ceremony. And here’s the three of us. Anela’s holding the Ace Attorney congratulatory card gem made for her! Pretty sweet. After the ceremony, we sampled some of the food they were serving before moving our cars to go to dinner. This is an Anela-car sandwich – her Toyota RAV4 sandwiched between our Toyota Camrys! We treated Anela to Go Goo Ryeo Korean BBQ for a graduation dinner. It was super tasty! I think the three of us seem to have a thing for Korean BBQ 🙂 No complaints here. It was a really great evening, and I’m glad I was there. Congratulations, Anela! 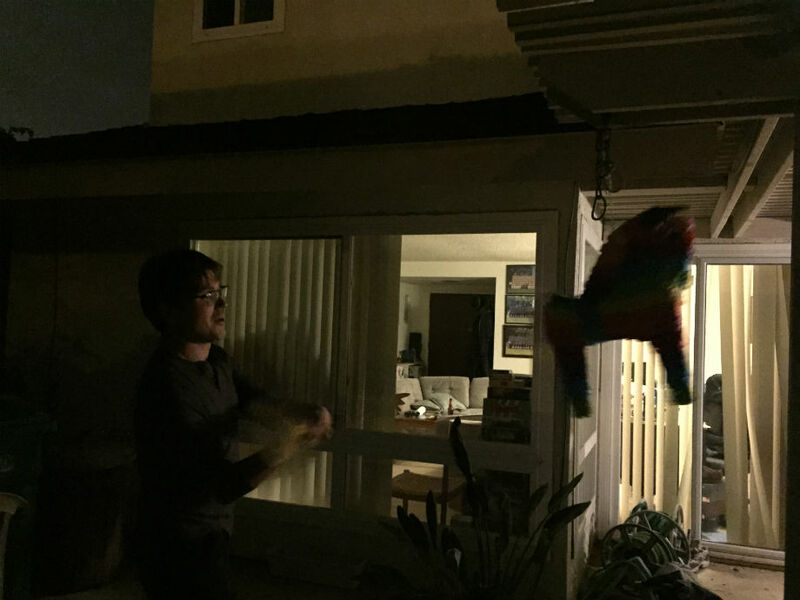 This entry was posted in Journal, Photos and Screenshots and tagged anela, chapman, chapman law, chapman university, go goo ryeo, graduation, korean bbq, m. margaret mckeown on May 23, 2015 by TheUser. 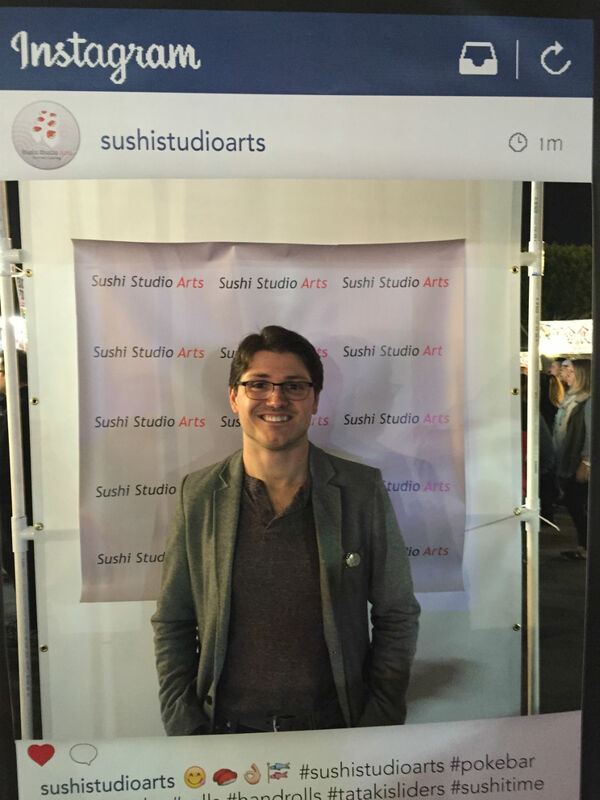 The OC Night Market was last weekend, and I ate so much. But first I looked at these cute crocheted buddies! Someone took a sweet boobsnap of Jon. Who was it? No one knows. But it wasn’t me. And actually I do know. We started our eating adventure with garlic crab fries and a hot dog with nori and spam. We got in line for more deliciousness, but the line was taking forever. After ordering, Duncan and I decided to grab food somewhere else while Jonathan and gem waited for our food. On the way to our soup inside a roll things, Duncan took my picture in this Instagram prop. He also found $10 on the ground. I think he won. It took an hour, but we finally got our food – delicious pork belly in that gloriously soft and wonderful bread. Yeah, it took a while, but honestly, I’m also there to socialize and have fun, and that’s exactly what I did while waiting. We also managed to eat sushi nachos from Samurai Burrito and a pork taco before getting to dessert (my favorite). First up for dessert was the Horchocolata Delight from Orion’s Cookery, consisting of chocolate mousse, horchata tapioca pudding, dulce de leche dipper, and cinnamon-sugar whipped cream. Yeah, it was delicious. 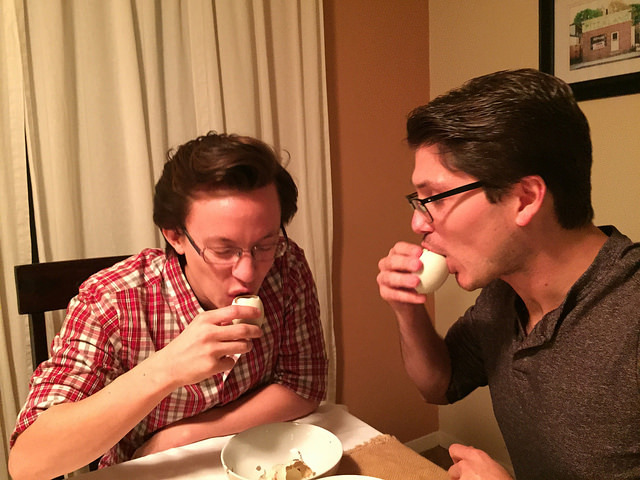 I bet I could eat chocolate and tapioca puddings together to simulate it! After that, I had a Dirt Cup from Ice Cream Garden LA. The dirt cup is ice cream served in a plastic plant pot, covered in crushed Oreos to simulate dirt, and topped with a gummy worm and a sprig of mint. Amazingly cute and very delicious to boot! Not shown was my final dessert – some of Duncan’s funnel cake. gem decided to work in the Hug Deli, which was a really interesting booth. 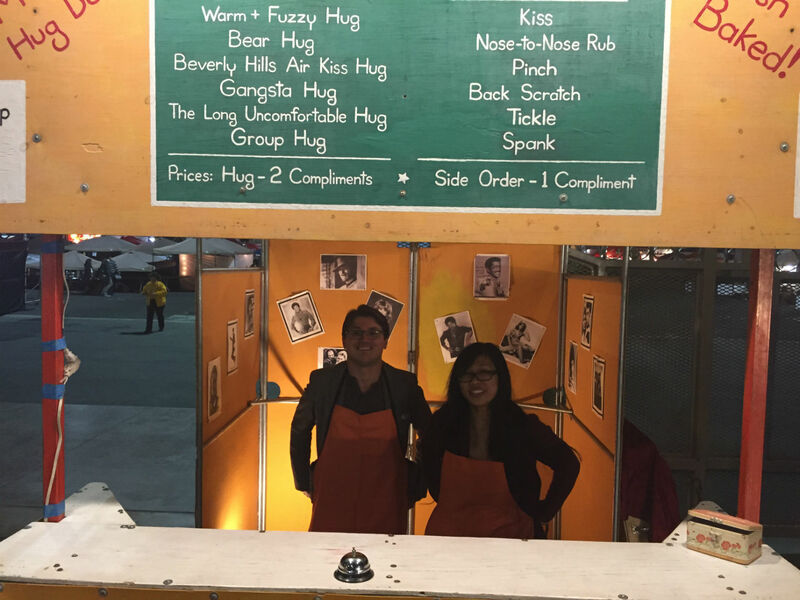 They have a menu of various hugs – the Warm + Fuzzy Hug, Bear Hug, Beverly Hills Air Kiss hug, Gangsta Hug, The Long Uncomfortable Hug, and the Group Hug, each priced at two compliments. If no one’s working the booth, you can walk inside, put on the apron, and start serving up hugs! You can find Mikey’s Hug Deli on Facebook! Rather than get a hug from gem, Duncan went to the other guy. At least he got a hug! gem did really well. 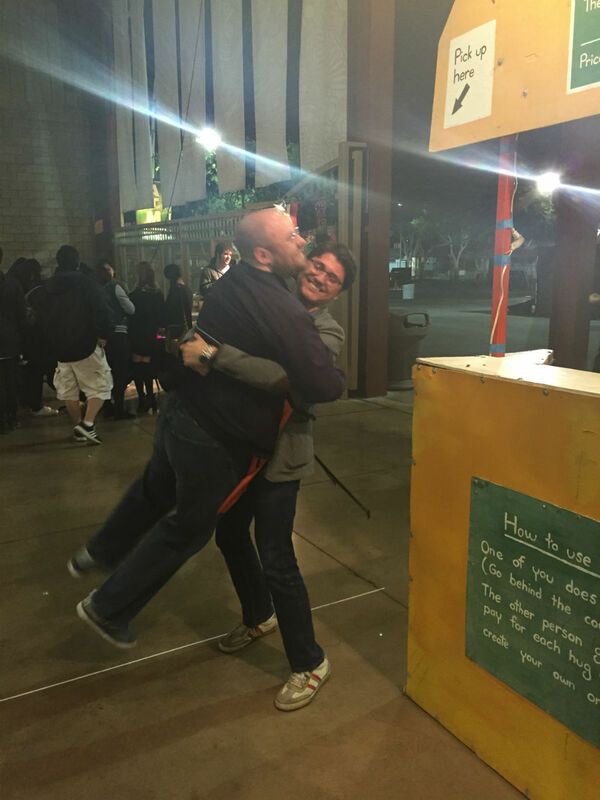 It was fun listening to people work up the courage to order a hug. One guy seemed a bit shy and wasn’t sure what compliments to give. His friends were talking about her smile. I was a little hesitant, but I had to get behind the counter too. I only got one order. Thanks Duncan! I gave him a huge hug and swung him around a bit. His compliments were that he liked my chest hair and that I had nice glasses. You too, buddy! This entry was posted in Art, Events, Food, Journal, Photos and Screenshots and tagged crochet, dirt cup, duncan, fair, gem, horchocolata delight, hug deli, ice cream garden LA, jonathan, mikey's hug deli, oc night market, orion's bakery on May 12, 2015 by TheUser.